Sumner went on at great length about the troubles Kansas suffered: invasions from Missouri, the theft of elections, violence and intimidation of all kinds. Proslavery men had turned the land into a war zone, or near enough, and reduced antislavery people in Kansas to subjects of a foreign power. They called that popular sovereignty. But the Bleeding Kansas category on this blog goes into great detail about how all that played out and we don’t need to review it all. Sumner means apology in the classical sense as an excuse or defense, rather than begging pardon. He referenced the French Wars of Religion here. On St. Bartholomew’s day, France’s Catholics indulged in a wave of targeted violence and murder against their Protestant neighbors. We don’t remember these struggles as much today, but they informed nineteenth century America’s association of Catholicism with tyranny. In an overwhelmingly and self-consciously Protestant nation, this history had special resonance. He also had a broader point. We like to think that any historical horror drew widespread condemnation. What we imagine as indefensible, we project back into the past. More often than not, we have it backwards. People do not wake up and decide to play the villain, but rather do things they believe right, good, and just. If you asked the Missourians, they would tell you that they protected their families from a slave revolt, defended their own property, safeguarded the virtue of “their” women, and preserved honor and decency in the face of a rich corporation full of religious fanatics bent on enforcing their will on the world. In short, they sought to protect their community of little guys from the great and powerful. To put it like that makes them sound more than halfway right, like people we ought to view with sympathy in a country with a longstanding fondness for underdogs. We might even see some of ourselves in them, which doesn’t make for the most comfortable time given they fought for slavery. 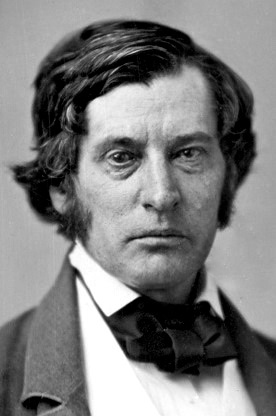 This entry was posted in Bleeding Kansas, Road to War and tagged Antislavery, Charles Sumner, Republicans.